Thank you, I forgot. You know, as I was typing in the address I was thinking that very different websites probably come up. Totally forgot about the "crafts" on the end!!!! 1 INCH SCALE DOLLHOUSE WALL HANGING PLANTERS - How to make 1 inch scale dollhouse wall hanging planters. I know it's past the flower season for my part of the world but you never know what a miniaturist will be working on at any given time. The top picture is a miniature copy of a flower pot holder my youngest daughter gave me for Mother's Day a long time ago. The bottom picture is a flower pot on a plaque, the pot is tipping out at the top. I am going to make the flower pot holder first. I am using my oval template (or ellipse). These are available from art stores or stores that carry drafting supplies. There are different degrees of ovals. I am using the 50 degree ovals. I am using the 7/8", 50 degree oval. Position your template over a scrap of mat board with the middle marks of the oval at the edge of the mat board. I am using Q-Tips for what would have been wire. You could use wire, too, I find it hard to glue. Remove the cotton tips, don't cut off the ends, remove the cotton. We need the length. There are lolly-pop sticks available now in the cake decorating section of Micheal's. They are longer and would be good for other projects needing a longer length. For some reason these sticks aren't letting me sand down to loose paper. I used my craft knife to cut into the stick to peel off the layers of paper. Anyway you do it, either sanding or cutting, peel away the layers until you get to about a 1/16" in diameter. Cut off the extra paper. Be sure to seal the edge of the paper with glue, I am using yellow carpenter's glue. I can't show it here, but peel back the paper a little bit and apply the glue inside the layers. Roll the stick to seal. Cut notches in the corners of the mat board half-oval. These notches will be where you will glue the ends of the stick. The notches are about 1/16" square. Carefully bend the stick over something round, I used my pencil. I am using yellow carpenter's glue. Glue the ends of the stick into the notches. I am using tulle that is from a roll. I found this at a party supply store and it comes in many colors for decorating at weddings. Apply glue to the back of the frame. Not as much as I have, though. Press the frame onto the tulle. Make sure you do this on something that the glue will not stick to and you can remove the whole thing easily. Let this dry before trimming off the extra tulle. After you have trimmed, apply a little glue the back of the frame to seal the tulle. Remove the cotton from the tips of another Q-Tip and unroll the paper to about a 1/16" in diameter. Trim the extra paper off and unroll a tiny bit more and apply glue to the edge. Roll the stick to seal the edge. Holding one end even with the back of the frame bend the rest of the stick around the mat board oval. Trim the end even with the other side of the oval. Now, you have two sticks. Straighten the stick and trim other stick to the same size. I am shaving off part of the end of the stick. Don't cut any length off, just shave off about half of the diameter. I shaved off anywhere between 1/16" to 1/8" from the ends of both sticks. I am showing you the end of the stick. When you do this to the other end mind that you have both ends at the same place. In other words the shaved ends have to be directly across from each other or you will be twisting your stick to glue the flat ends to the frame. This will pull the frame into a twist. Glue one stick to the edge of the mat board oval. Measure up from the bottom of the frame 7/16" and mark both sides. Before you glue the top stick on bend it over a pencil to get the curve started. Glue the other stick onto the frame at the marks you just made. Lay the tulle over the frame and measure for the width from side to side over the sticks you just glued on. Dry fit the tulle inside the frame. Remove the tulle and apply glue to mat board. Put the tulle into the frame making sure it sets in the glue. Set the frame aside for a minute to let the glue set up. Unroll another Q-tip. This time we need to unroll to a very small diameter. This is going to be the hanger. Be sure to seal the layers of paper. I wrapped this stick around a toothpick to make the hanger. Glue the stick together and secure with a clamp. Back to the frame. Apply glue to the top stick and press the tulle into the glue. Let this dry before you trim. This is the pattern for the flower pot. At the left of the blog is a listing of tutorials, "Things to do, Things to see," in this listing are directions to copy the patterns, "HOW TO RE-SIZE PATTERNS". You can copy many of them onto card stock to use later. I have one I am going to trace onto card stock. 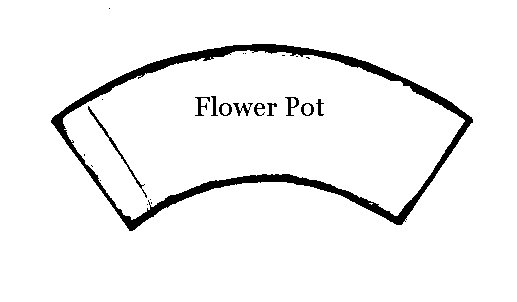 I've traced the pot. Then I traced the top of the pot and measured down 3/32" and made marks that I am filling in. This is the rim or lip of the pot. I've cut out the pot and the rim. Bend the pot around the tip of the pencil. Apply glue to the end of the pot and fold over the other end to the line. Hold with clamps. Apply glue to the bottom of the pot and set onto a scrap of card stock. Let dry. I leave the scrap of card stock on for the next step, it gives me something to hold on to. Apply glue to the top edge of the pot and clamp on one end of the rim. Continue pressing on the rim until you get to the other end and clamp both ends to the pot. Trim off the extra card stock. Trim off the extra tulle on the frame. Trim off the ends on the hanger and glue to the center top of the frame. There's the flower pot inside the plant hanger. I am painting the plant hanger silver and the flower pot a clay color. Since we all ready have the flower pot made I am going to show you my favorite wall hanging flower pot. I am using the oval template again. This time I used a 40 degree oval, the 15/16" size. Trace onto a scrap of mat board and cut out. I drilled a hole at the center top of the oval. I am showing you the shape I drew on the bottom of the flower pot. I cut that shape out. This will make the flower pot tip out from it's plaque we cut from the mat board. Apply glue to the flower pot, not as much as I have! Press the flower pot onto the plaque. To cover the edge of the mat board I made a piece of twisted embroidery floss. For a small amount like this I cut about a 12 inch long piece of embroidery floss, keep all six strands together. I tie a knot in each end to give me something to hold on to. I twist and twist the floss, depending on how much you twist will determine how tight the finished twist will be. When you are done twisting loop the middle over something like a hook and bring the ends together. Remove the floss from the hook and gently help the floss twist back the opposite way. Glue the floss onto the edge of the mat board. I paint this a clay color, too. These leaves for the vines are just two sizes of heart shaped punches. I always say, "Make more flowers and leaves than what you think you'll need. You may want to make a small arrangement in a hurry and you will have something to use." I used floral foam to fill the pot. I put a dab of glue in the bottom of the flower pot holder. I dipped the end of the wires into glue before inserting into the floral foam. I had some petunias left from a previous project so I used them for the other hanging pot. The petunias are made using Ruth Hanky's pattern, www.hankypanky.com. Of course, this is just a start. You can use other materials to put into the frame, try the paper basket weaving from a previous blog. You can also cut your plaque a different shape.